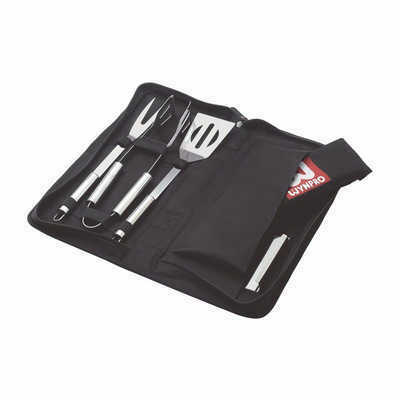 5 piece stainless steel BBQ set. Includes: fork, spatula, tongs, grill cleaner and black cotton apron with pocket. All in a 600D black polypropylene zippered case. Supplied in polybag. Colours: Black,Silver, Dimension: 200mm H x 420mm W. Price includes : 3 Day Service* Transfer Print (10 DAY PRODUCTION ONLY) - One Colour/Location. Setup is included.